Battery Optimizer for Windows 10 - A handy tool for analyzing the power consumption of a laptop in offline mode. The utility in real time reports on changes that can help save a charge. The program is a simple tool with a multi-language, intuitive interface. The process of the application consists of the step of diagnosing the energy consumption of a personal computer, the period of quickly finding options for saving percent charge. A distinctive feature of the utility is to work, help "on the fly" in the background. 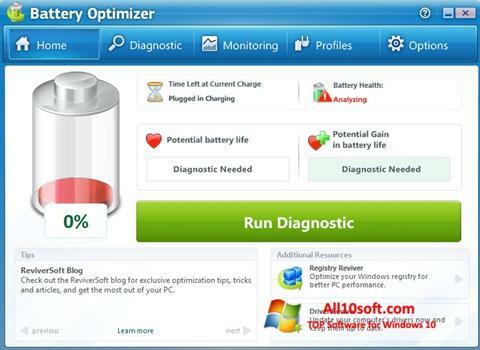 You can free download Battery Optimizer official latest version for Windows 10 in English.